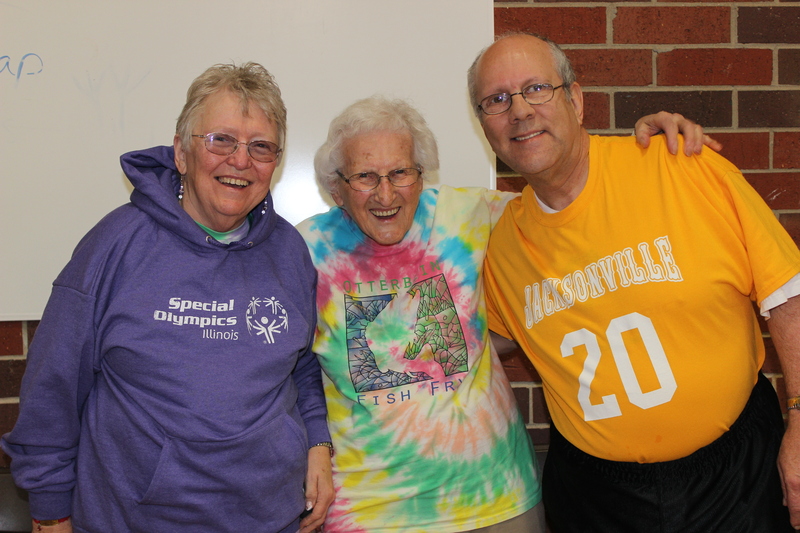 David Long of Jacksonville may have had the supporters who traveled the farthest distance to watch him compete in the Fall Games in Rockford when his mother and her friend drove in from Lebanon, Ohio. Pauline Bailey and Susan Hopkins, her friend and driver, traveled more than 350 miles or about 8 hours to see David, whose 60th birthday was Oct. 29. 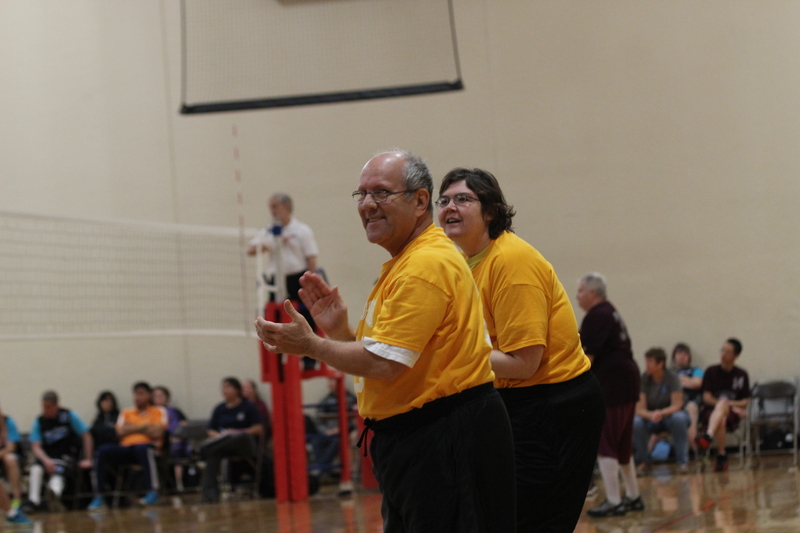 Pauline, 93, was thrilled to watch David compete with his Pathway Services Unlimited team compete in modified volleyball at Harlem High School in Machesney Park on Oct. 26. The team, Jacksonville Gold, captured bronze medals in their division. 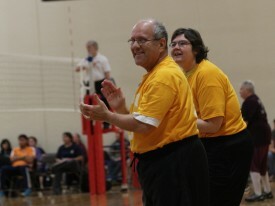 David’s mother believes this was the first time she had ever had the opportunity to watch him compete in Special Olympics. She was pleased to see that he was interacting with his teammates and coaches. David, who is deaf, has lived at a group home called Eades Center in Jacksonville for about 8 years. 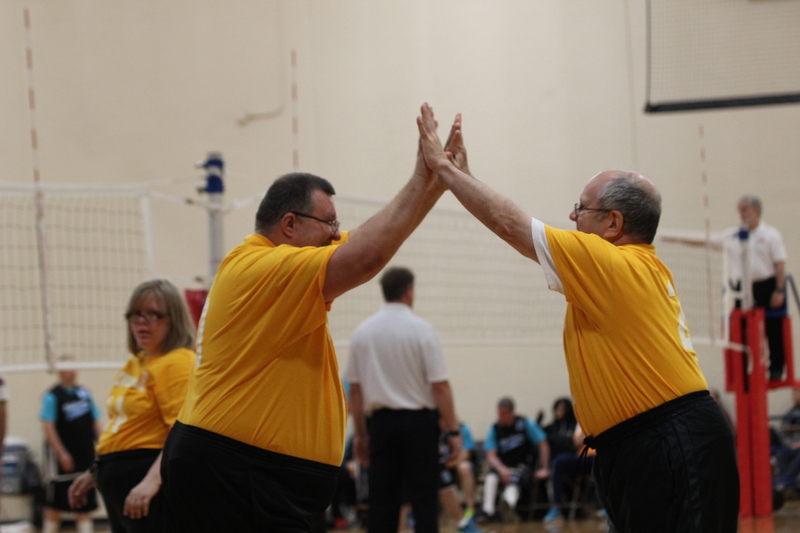 He competes in athletics, basketball and volleyball through Pathway Services. David grew up in Ohio with an older sister, Alice, and younger brother, Greg. He attended Kennedy School for the Deaf in Dayton, Ohio. When he was 21 years old, he moved to San Antonio, Texas, to live in a center for deaf citizens. While there, he worked at the airport and later at a hamburger restaurant, said Pauline, who moved to San Antonio later to be near her son. David was active in his church and enjoyed camping and square dancing. 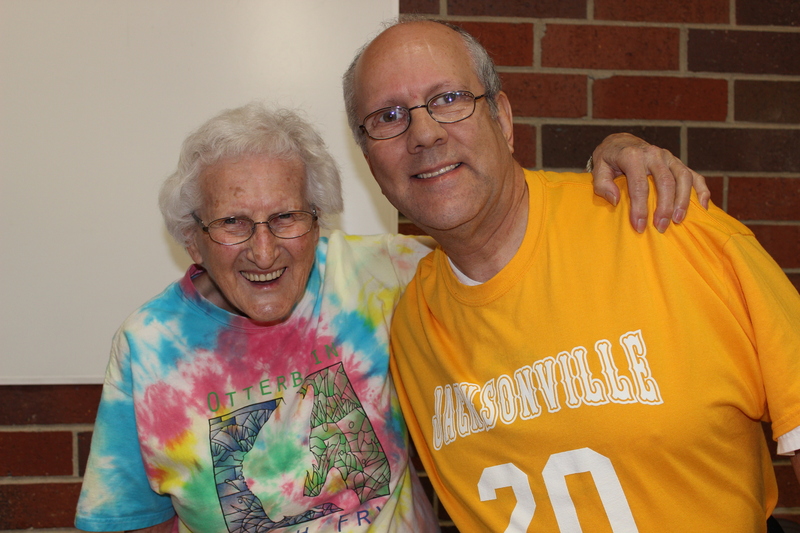 About 10 years ago, Pauline returned to Ohio to live at Otterbein Senior Lifestyles Center in Lebanon. David’s brother Greg, who is a professor in Allied Health and Communication Disorders at Northern Illinois University in DeKalb, looked for a living facility for David closer to home. Pauline and Susan originally thought that David’s team was competing on Saturday instead of Sunday at the Fall Games and had not booked a room for themselves for that Saturday night. 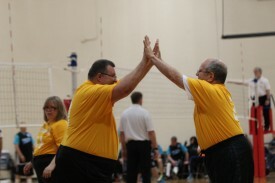 Richard Larkin, Special Olympics Athletic Director for Pathway, arranged for the women’s lodging and took them to dinner with the team on Saturday night. “The people from Jacksonville really took good care of us,” said Pauline. On Oct. 29, David celebrated his 60th birthday with his mother, brother and Susan in Jacksonville. “I’ve only missed one of his birthdays in 60 years,” said Pauline.